In the 17th in a series of posts on 2011 short story collections entered for The Story Prize, Siobhan Fallon, author of You Know When the Men Are Gone (Amy Einhorn Books/Putnam) explains why she wrote a book of connected stories rather than a novel. You Know When the Men Are Gone is described as a collection of linked short stories. Why was it so important for you to use the short story form rather than the novel? Personally, I’m a sucker for a short story. As a writer, a collection offered me the freedom of writing about distinct worlds, from the families of Fort Hood, Texas, to the soldiers of Camp Liberty, Iraq, without neatly stitching them together in a way you might expect from a novel. And the physical structure of a short story collection, with cyclical new beginnings and unexpected endings, helped me evoke the emotional landscape, the upheaval and disconnect, of military families during deployments. I wanted the reader to feel an echo of that displacement: Families move to new bases so often it seems that as soon as they are comfortable, it is time to move again. So the format of a collection was not only the best way for me to tell You Know When The Men Are Gone, but it was the only way. There were also times that telling a short story made my job as a writer easier. The physical nature of stories, those multiple starts and stops, allowed me to leap over the time and distance of a deployment, that seemingly endless waiting both soldiers in Iraq and families in Fort Hood have to slog through during the twelve months they are apart. Each story shifts focus from one family or couple to another, and, in this episodic way, I felt like I was able to emphasize how every corner of the Army community—neighbors in the same housing building or total strangers from one side of the base to the other—was affected. Lives cross paths, but Fort Hood is a big place with more than 30,000 active duty soldiers alone; sometimes there is a shared apartment wall or a shared Humvee, but, like life, I didn't want too much overlap. I wanted to recreate the sense of separateness, the way people are always coming and going. Individual short stories could do this, each title stacked together tenuously in the Table of Contents but not merged together, the stories touching but never completely entwined. I am also a fan of the "short" in short story: the brevity is often part of its glory. Irish writer William Trevor calls a short story ''an art of the glimpse,'' whose ''strength lies in what it leaves out.'' There are so many permutations in a mere glimpse—how the writer takes a single moment and fleshes it out in such a way the reader can see an entire past and future stretching out from those few written pages. As Flannery O'Connor said, story writers are attempting to capture the "extraordinary magic that lies in the everyday." This is what I was trying to conjure up: the eavesdropped words that fill a listener with curiosity or paranoia, the baby drinking a bottle that offers a connection between a husband and wife at odds, a soldier with a memory of a death that gives a widow a reason to keep living—all these moments spooling outward, demonstrating that the possibilities of a short story are endless. That’s the instant the short story writer seizes upon and relishes: the moment when anything can happen, when the ordinary does indeed become extraordinary. 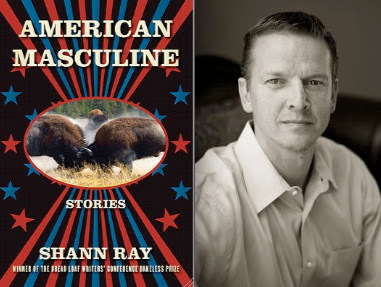 In the 16th in a series of posts on 2011 short story collections entered for The Story Prize, Shann Ray, author of American Masculine (Graywolf Press) traverses mountains and history to explain the power of short stories. Children live on one side of despair, the awakened on the other. The statement carries uncommon gravity. I am reminded of the beloved women and men in my life who have shown me that true living is ultimately tied to a sometimes painful awakening. I recall walking as a boy with my father in the Beartooth Range along the eastern front of the Rockies in southern Montana. 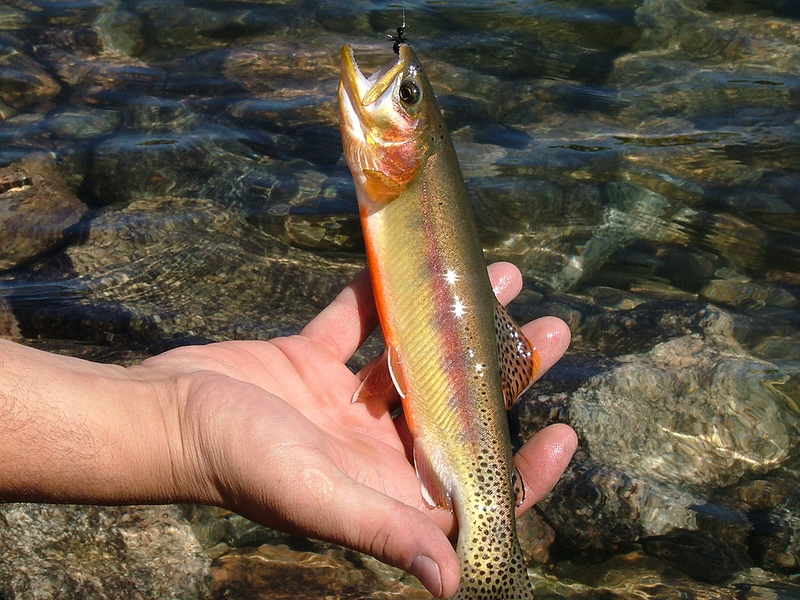 We wanted to catch the striking and elusive Golden trout, a delicacy of high mountain lakes and streams. The only problem was a five-mile climb, near straight up, along steep, rugged switchbacks, rocky and severe. I was twelve years old and when my dad told me of the hike, and how hard it would be, I wanted no part of it--too much work, not much play, and in the end we might not even catch any fish. My thoughts were consumed with excuses and even anger at my father for suggesting we go for Golden trout, rather than the Rainbows that filled East Rosebud Lake (no hike at all) or Mystic Lake (a comparatively easy hike over relatively flat terrain). But my father convinced me not only to go with him but to make the trip worthwhile, to enjoy the challenge together, receive the beauty of the Beartooths with wonder and respect, and not give in to everything in me that wanted to complain or blame. His own spirit of delight pervaded the air. He was in love with every aspect of entering the mountains. He was present. when we rested, helping me progress again. The hike was far and away the most difficult of the hundreds we took together, and many hours passed before we crossed a final up-slanted swath of mountain grasses, grabbing at the roots of windblown trees as we scrambled slowly on all fours. At last the destination came into view and we pressed our hands into the earth, dug in our feet and went step by step until finally we crested the lip of a massive rock bowl and stood and looked down on Silven Lake—a blue gem encased in the heart of the mountains, reflecting the heart of the sky. When we discover a beloved short story, one we might keep with us forever, we recognize the inner journey that has led us to a new place. By the time my father and I crested the jagged lip of the mountain, my thoughts had changed. Even now, decades later, when I think of him and of the mountains of Montana, I think of gratitude, affection, confidence, love. Montana is the land of 100 mountain ranges, many with crags and ridges and cirques and spurs and escarpments that touch the sky at 8,000 to 12,000 feet. My father too contains many wildernesses, as do we all, and the short story acts as a guide to the inner landscapes of our lives. When we surrender to the a hunger a great short story generates, we often encounter the difficult terrain of our own vulnerability. In the bold mountains of Montana, the sun is big and shines bright in a seemingly endless sky. A great short story, too, is expansive and imbued with a natural capacity for grandeur. The sun rises like a champion, delighting to run its course. When the heart receives illumination, the story’s fine burn can lead us to a sense of humility and the desire to be more present to ourselves and the world. In this sense, illumination is a sure and present light, the steady glow of a candle in darkness, the majesty of the sun at dawn, and evokes the subtlety and power of what Hesse referred to as being awakened. Another story, this one set in World War II, and defined solely by true events, affirms Hesse’s prophetic sense of the role of art in the world. Viktor Frankl, the great Austrian thought leader, was a contemporary of Hesse. Born in 1902 in Vienna to a Jewish family of civil servants, Frankl rose to become one of the leading neurologists in Europe, serving as head neurologist in the Selbstmörderpavillon or "suicide pavilion" of the General Hospital in Vienna. He treated more than 30,000 women prone to suicide, and when the Nazis invaded Austria and he was relegated to practicing medicine only with Jews, he continued his neurology work, also worked as a brain surgeon, and succeeded in giving medical opinions that saved many patients from being euthanized during the Nazi euthanasia program in which Nazis routinely found and killed people who were handicapped or mentally ill. When the Nazi regime began to exert more and more influence in Vienna, Viktor’s parents arranged for him to attain exile in America. Viktor, however, was not sure he should go. If he went to America his parents would face a very difficult future, but his life would be saved. If he stayed in Austria he felt he might be able to act as a buffer to serve and protect them. He agonized over the decision and in the end decided to wait for a Divine answer. When only days remained before he must decide Viktor came home and found his father seated at the kitchen table with a piece of rubble in front of him. Viktor asked what happened and his father told him the Nazis had destroyed the temple that day. From where Viktor stood he saw a symbol engraved on the piece of broken rock, a mark his father had not yet noticed. Looking closely, Viktor made it out: the mark was a number from the Ten Commandments, the very number for the commandment honor your father and mother. Man is that being who invented the gas chambers of Auschwitz; however, he is also that being who entered those chambers upright, with the Lord’s Prayer or the Shema Yisrael on his lips. 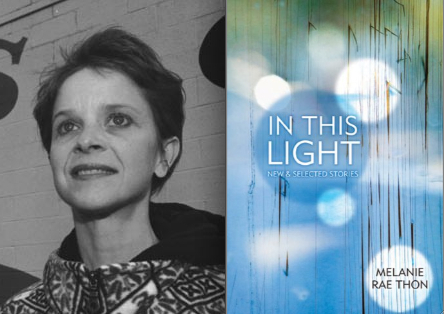 In the 15th in a series of posts on 2011 short story collections entered for The Story Prize, Melanie Rae Thon, author of In This Light: New & Selected Stories (Graywolf Press) discusses "dreaming the lives of" others through the stories she writes. Stories are catalytic convergences. Fears, obsessions, haunting images begin to leak from my subconscious mind into my waking experience. I lived in Boston for many years, worked as a waitress and then an adjunct instructor. My “apartment” was an attic room without insulation. I froze in winter, fried in summer. Still I knew how lucky I was to have shelter, food, a job, a doctor. I walked everywhere, miles and miles every day, through all parts of town, tame and dangerous, in all kinds of weather. I encountered the homeless, the poor, the extravagantly wealthy, the addicted, the recently immigrated, the excessively educated. One brutal winter, a storm surged up the coast every weekend. I lost power for days at a time. Pigeons flapped at my dark windows. I walked. And there they were: the kids, throwaways and runaways, the unloved and unlucky. The emaciated Haitian refugee shivered in Harvard Square, playing his guitar, trying to earn a few dollars. He was a brilliant musician, but his eyes were yellow where they should have been white. I thought he would die soon. The man with no fingers slept in a doorway and could barely move; as I passed, he opened his bare palm and lurched toward me. Cold and poor, yes, I was—but also ridiculously privileged. Then I got sick, really sick, with a life-threatening illness that remained undiagnosed for over two years. I lost thirty pounds; my strong body withered, suddenly weak, feeding on its own muscle. My eyes bulged—yes, just like all the “crazy street people.” I quivered all the time; my heart hammered so fast and hard I could see it thumping through my skin. I woke tangled in my sheets, drenched from night sweats. Working became more and more challenging. By then I was an adjunct instructor teaching four classes a semester at three different schools. I couldn’t think. My skittery body mirrored my jagged mind. I was too fragile and weird to get a job as a waitress. I saw, I felt, I knew how easy it would be to lose everything. The lives of the people I saw on the street became vivid to me, intensely personal. I began to imagine how those children might survive, who they might love, why they were out there. I began composing “Nobody’s Daughters,” dreaming the lives of Nadine and Emile. In all my stories, the lines between victims and perpetrators blur. The homeless kids in “Xmas, Jamaica Plain” commit the crime of breaking and entering, but their survival on the streets of Boston depends on their acceptance of the fact that they must allow themselves to be exploited. Every piece in the collection can be traced backward into mystery: a rupture in my intimate life (illness, injury, guilt, loss, transcendent love, exceptional mercy) compels me to imagine another person’s experience with greater curiosity and compassion and wonder. Anna Deavere Smith says she recognizes the gap between herself and the people she represents in her plays. The thrill of the experience for writer or actor, viewer or reader, is to move into that space, to become other than oneself while still acknowledging and respecting the infinite unknowable mystery of every other living being. I love working in that space. I know I am not “Nadine” or “Raymond” or “Margalit,” but the research I’ve done for every line of every story, the fever and joy of imaginative compassion, the search for each speaker’s particular poetry, the wild immersion in the sensuous magic and creative abundance of every environment and every experience has freed me from the limits of myself. We are all capable of moving outside the boundaries of our isolated “identities.” Those identities are false constructions that inhibit our capacity for love. My work makes me less afraid, and for me this is its ultimate “purpose.” Love pours through the fiction and rises out of it. I live differently in the world because of the stories I’ve told. This freedom is the adventure I find endlessly exhilarating. The Cake Shop in New York sells cake, but it’s also a bar, a record store, and a live music venue. In short, it seems an unlikely place for a reading. A deep stairwell leads down to a long room with a low ceiling and a stage decorated with yellow Christmas lights and red and gold tinsel. None of this, though, distracted from Paul Lisicky's and Nick Ripatrazone’s reading on Sunday for the release of Ripatrazone’s Oblations. Paul Lisicky is the author of Lawnboy and Famous Builder. He teaches at NYU. The work he read from was a primer on the value of travel for writers. He read first from work inspired by his stay in North Carolina while teaching at UNC Wilmington. Usually a first person stylist, Lisicky ventured into the third person for his new work. Highlights included a story about a boy who finds that he no longer loves the ocean as he once did and an unusual piece about an alligator who lived in a containment pond behind a Walmart. As always, Lisicky balanced an economy of language against the urge to lyricism in his work. He concluded with a pair of stories written in recent months. Ripatrazone teaches AP classes in public school, recently completed his Masters of Fine Arts at Rutgers University-Newark, and works as an adjunct there. Yet despite all that, he still managed to put together Oblations, a collection of prose poetry published by Gold Wake Press. The collection itself is broken into five parts: barns, baseball, miscellanea, work, and parishes. He spoke to this design during his reading. His move to rural New Jersey helped renew his interest in the tension between traditional rural living and the new energy which infuses such places with the arrival of transplants from the city. Ripatrazone’s pieces unfold through a series of short utterances. His writing is pared down and gives an impressionistic sense of people, places, and language that few writers are patient enough to record. 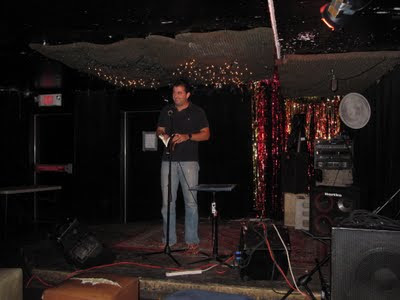 He finished with a reading from his new work, more conventional poetry than Oblations. 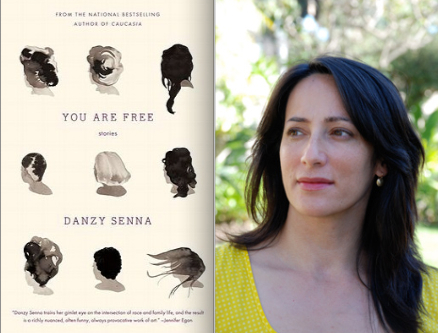 In the 14th in a series of posts on 2011 short story collections entered for The Story Prize, Danzy Senna, author of You Are Free (Riverhead Books) discusses how—and why—she wrote three variations on a story within a single story. A good story collection should offer distinct but cohesive set pieces of art. These stories should speak to each other – but not in unison. 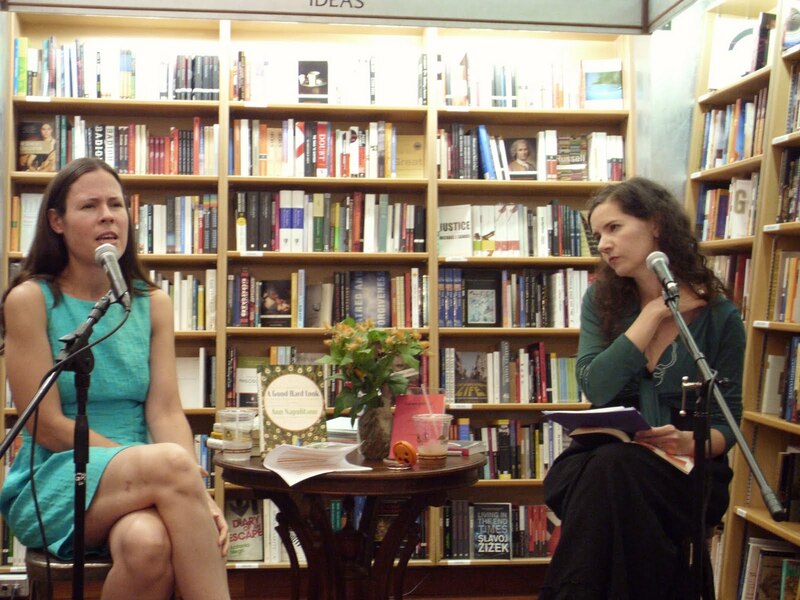 The stories in some of my favorite contemporary collections – Lydia Davis’ Break It Down, Amy Hempel’s The Dog of the Marriage, or Mary Gaitskill’s Because They Wanted To – don’t build on top of one another, like chapters in a novel, but build toward a center or radiate outward. And connecting all of the disparate voices and characters is a single author’s vision – perhaps ironic, perhaps brutally compassionate, perhaps willfully restrained – of the world and of our culture. I used to have a whole organized system for getting work done. Now that I have children, I write when I can – “by any means necessary.” Often I get the most done at night, when my little ones are asleep. I like to write by hand for part of the first draft to get myself going. Then once I feel the story gaining enough energy and focus, I become impatient with the slow pace of handwriting and switch to a computer. I also create deadlines for myself. I have a writing group of fellow writers whose work I really respect. I set myself up by telling them about a new story I plan to show them at our next meeting. Then I am driven to write it because I will be humiliated if I don’t. My most formally playful story, “Triptych,” is essentially three nearly identical stories. Three times I repeat a simple tale of a girl coming home from college after her mother’s death and grappling with her own resentment of her father and her own sense of loss. It’s a story about grief and about leaving home. But I wrote it three times, each time changing – through small but significant details – the character’s race. In the first narrative she is white, in the second she is black, and in the third she is biracial. I wrote it after I was asked to submit a story to an anthology about “mixed-race identity.” I was feeling tired of the “burden of representation” – that is, the way we writers of color are always being asked to represent our culture, our racial perspective. And I was tired of the fact that even when we are writing about something else – a larger universal theme or loneliness or grief or dishonesty or relationships – we are told we are writing about race. When race enters the narrative, suddenly the work is read as only about race. “Triptych” was my attempt to address this while at the same time to write about what really interested me: memory and grief. Race enters the narrative differently in each story – subtle signifiers change with each version, cluing the reader that the protagonist is now a different race. I wanted to examine how it changes the way the story can be read. What do we project onto our characters based on their race? I knew I was taking a risk because a reader might be irritated or confused to see what is almost the same story repeated three times – and on a quick reading, they might not even notice which details change, and why. But for me it was an important exploration, and so I went ahead with that risk and had to tinker with it a lot before I was satisfied. There are so many writers who have inspired me through their example. I’m especially inspired by longevity and resilience in writers. My mother, for instance, is a poet who is in her seventies now. She has written through being praised and being ignored, through being criticized and being lauded – and at the end of the day, she somehow goes back to the quiet practice of writing her next work. My husband, who is a novelist and has been writing longer than I have, has this same commitment and ability to shut out the outside voices. This is something I aspire to do: to keep returning to that silent solitary space – to be committed to writing as a lifetime practice, independent of the external reward. “I’ll call anything a story in which specific characters and events influence each other to form a meaningful narrative,” Flannery O’Connor claims, with her characteristic tenacity.† O’Connor’s attitude toward fiction welcomes reality—whatever that may be—as the originator of meaningful narratives. Fiction and reality, though disparate entities, are inextricably wound together. Stories are merely how we make sense of them. An event on Aug. 4, sponsored by One Story, negotiated this line between fiction and reality, with O’Connor’s life and work as its hub. 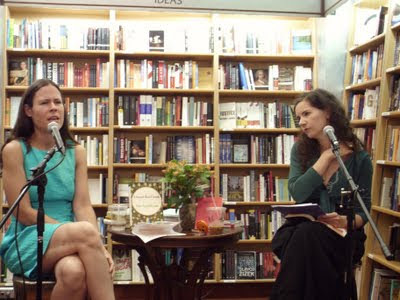 One Story editor Hannah Tinti and novelist Ann Napolitano discussed Napolitano’s new novel, A Good Hard Look, and O’Connor’s influence in the packed lower level of New York’s McNally Jackson. Napolitano set her novel, in which O’Connor is a pivotal character, in Milledgeville, Georgia, toward the end of O’Connor’s career. Napolitano riskily places her readers alongside O’Connor as the storied author struggles with the writing process. Ann Napolitano discusses her novel A Good Hard Look. But the novel isn’t another how-to guide on literary craft. O’Connor’s presence as a person in this narrative binds her to the fictionalized Milledgeville community. Napolitano’s O’Connor forges relationships with imagined denizens of Milledgeville, including New Yorker Melvin Whiteson, who married former town belle Cookie Himmel, an ardent opponent of O’Connor’s seemingly clairvoyant prose. These ties lash an epiphany to O’Connor’s wrists: Life is a narrative, and somebody has to find meaning in it. Tinti prepared the audience for the evening’s topic with O’Connor commenting on the art of the story: “I have very little to say about short-story writing.... I hope you realize that your asking me to talk about story-writing is just like asking a fish to lecture on swimming.” O’Connor expands on her simile with the assertion that “nothing produces silence like experience.” The impression is that we must cope with experiences and histories by performing (and not simply recounting) those events in fiction. O’Connor does this in her prose, and Napolitano in turn dramatizes O’Connor and her struggle with lupus in a conceptualized Milledgeville. O’Connor’s terminal experience with lupus provoked her to concentrate on writing before anything else, and her personal understanding of human frailty—both physically and psychologically—honed her prose into an honest reflection of humanity. She portrays this without transforming her characters into transparent avatars. 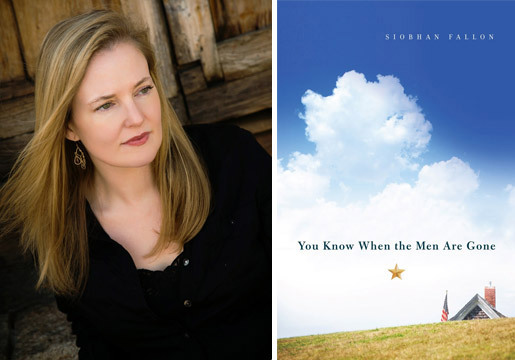 Instead of a veiled retelling of her own life, O’Connor adapts her struggles to push her readers toward an understanding. In “Good Country People,” a tale at once cautionary and humorous, a con-man (posing as a Bible salesman) dupes a woman who has an artificial leg. Even with such apparent internal and external faults, these characters remain human in their own element, and nothing suggests a lament for O’Connor’s condition. O’Connor’s sentence-to-sentence precision, Tinti and Napolitano agreed, generates this effect in her stories. Serendipity, grace, and influence all exist in the writing process, as well. Napolitano informed the audience that she owes A Good Hard Look to her copy of Flannery O’Connor’s letters, The Habit of Being. She read the book for an undergraduate writing project and, years later, saw it on her shelf while considering how to circumnavigate a roadblock involving the character Melvin Whiteson. The epiphany, for Napolitano, was that O’Connor had to be in the novel. Her previous experience with the personal, wry, and witty voice in O’Connor’s letters allowed her to shape a genuine, emoting O’Connor on the page. †All direct O’Connor quotations come from the essays in O’Connor’s Mystery and Manners. 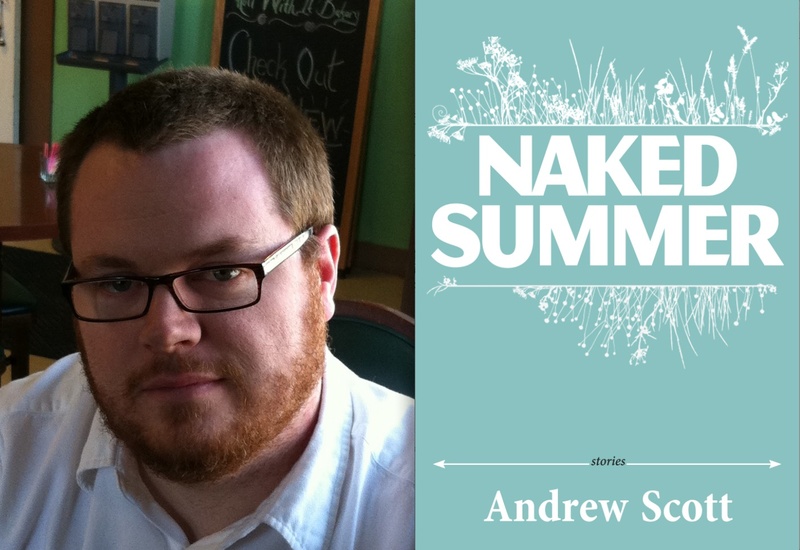 Andrew Scott: "We're All in the Same Boat"
In the 13th in a series of posts on 2011 short story collections entered for The Story Prize, Andrew Scott, author of Naked Summer (Press 53), talks mentors, feedback, and being an advocate for short fiction. My first mentor was Patricia Henley. She taught me what it means to care about sentences, stories, and people, and how these elements might begin to coalesce into a work of fiction. But she led by example in other ways, as she endured the long process of writing her first novel, Hummingbird House, and struggled to find a publisher for it, but she always put the “habit of art” first. The book was named a National Book Award finalist in 1999. I’m excited that her new story collection, Other Heartbreaks, will be published this fall. In grad school, Kevin McIlvoy was the most important mentor for me. He was the editor-in-chief of Puerto del Sol, where I worked as a co-managing editor, and he required new pages or revisions every week, and we’d meet to discuss them. I wasn’t the only student he worked with, either. I began to walk faster to match his swift steps down the hallway. He was always on the move, zipping around, getting things done. This part of the writing process is evolving for me. Most of the stories in Naked Summer were originally drafted ten to twelve years before the book was accepted. I’m about to turn 35, so I’m still a young writer in many ways, but when I was a young person, I enrolled in nonstop creative writing classes for seven years. So I was very much in the habit of writing a draft and presenting it to an audience. But in those long years between finishing the MFA program and publishing the book -- those “Writing in the Cold” years, as Ted Solotaroff called them -- I didn’t show my revisions to anyone for feedback, not even my wife, Victoria Barrett, who is also a writer and editor, though we certainly talked about the revisions and other works in progress. Now that I’m working on new stories and projects, I imagine I’ll want her valuable and necessary feedback as soon as I finish workable drafts. Comic books made me want to be a writer. Or a writer/artist, and then I gave up the art. I started reading more seriously toward the end of high school. In terms of literary fiction, the first novel by Don Kurtz, South of the Big Four, is probably my favorite book, and because it’s set in Indiana, it gave me permission to write about the people and places I cared about and knew best. I also read the hell out of Robert Boswell’s Living to Be a Hundred, which I borrowed from a friend and didn’t return for many years, and Richard Ford’s Rock Springs. When a girlfriend and I broke up, I made her go inside her apartment and return the copy of Rock Springs I’d let her borrow. She also had one of my CDs, but I only cared about the book. Not exactly. Esquire sent a cocktail napkin and asked me to write a story on it. I’d found an old file of notes I’d scribbled while working as a waiter, mostly overheard bits of dialogue, and I mashed up some of those lines with other ideas and quickly wrote “Living Guilt-Free in These United States,” what’s now the first story in Naked Summer. It came out in one big blast, but it’s less than three full pages in manuscript. I did tweak it here and there before copying it onto the napkin and mailing it back. That’s the closest I’ve ever come to a one-sitting story gift. You’ve done a lot over the years to advocate for short fiction. Do you feel any ambivalence about promoting other story collections through Andrew’s Book Club at a time when yours has just been published? Promoting story collections, especially by debut writers, is important to me. I do what I can, a little each month, to spread the word. Most of the authors seem to appreciate it. I haven’t loved every book I’ve chosen -- often I’ve read the book before selecting it, but not always -- but I’m glad to have helped them sell at least a few more copies. And choosing to not promote the work of others now that my book’s in the world won’t suddenly help it fly off the shelves. Many writers have helped me, in different ways. It just makes sense to help authors reach out to readers. We’re all in the same boat. Maybe it’s a big boat. Maybe it’s an ark, I don’t know. There’s room for all kinds, and there’s no need to shove. We just need to ride out this flood.